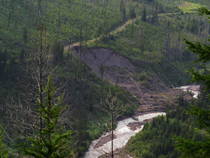 The Flathead National Forest is considering an alternative for its revised Forest Plan that would recommend Wilderness designation for almost all roadless lands, immediately protect those lands from motorized vehicles and mountain bikes, and lower the timber sale program to save taxpayers $2.2 million each year! Your comments are needed by October 3 to see that Alternative C is refined and combined with essential parts of the current Forest Plan to insure damaged fish and wildlife habitats are restored! Please ACT TODAY and we'll issue further alerts before October 3 to help you refine additional messages to the Flathead! Our Summer 2016 newsletter provides you a quick summary of the Flathead's Draft Environmental Impact Statement and provides links to important maps. 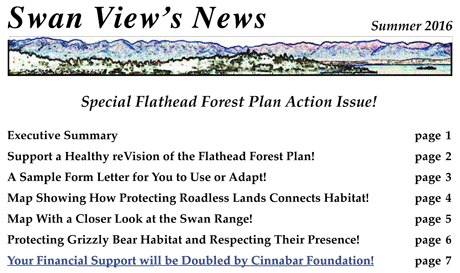 It also includes a sample letter that you can print and mail or cut and paste into the Flathead's comment page - and all the better if you personalize it with remarks about your favorite parts of the Forest! Below is our newsletter's table of comments and you can click here to view or download it as a pdf. We hope you enjoy the newsletter, follow the few easy steps to make your voice heard, and will join others in supporting our work (make a donation today and Cinnabar Foundation will double it)!